Hey all … thought I’d share some links to recent rA coverage. Journalist and food blogger Jean Railla talked about underground supperclubs on NPR’s Word of Mouth yesterday. Listen to the mp3 here … we get a short (but definitely sweet) shoutout. Perhaps this show now eclipses Ludacris as our favorite Word of Mouf? If you’d like to read the full Q & A with Ms. Railla, check it here on her blog Meal by Meal. Oh, and thanks to Foodie Buddha for the link love. “It smells like chicken!” was the chorus, in session after session, as the kids smelled the Welsh onions, frying in olive oil. It was rogueApron’s first Chef to School experience – this time a Career Day at Cook Elementary School, down the road from Daddy DZ and the Standard on Memorial. The gold capitol building glimmered to my right as I pulled up that morning, competing with fire trucks, SWAT teams and police officers for the attention of elementary school kids. I hustled the propane burner, the wok, the oil, and the salt up the steps of the school to room 106; where Spanish lessons happened among chaotic bulletin boards and a pile of sombreros in the corner. Farmer Duane Marcus was the first to arrive; piles of mustard, turnip, and broccoli greens tucked under his tattooed arms. We chatted briefly about the lesson plan, myself swilling coffee, in the moments before they piled in. Twenty of them! Little! Rambunctious! LOUD! The second graders, in a mad rush, pulled their tiny maroon chairs closer to the demonstration table – which, unfortunately for this cook – was knee-high and not conducive to chopping. Their teacher quickly moved them to the circular tables; while photographer Amy, Miss Juliet and Chip arrived to help. 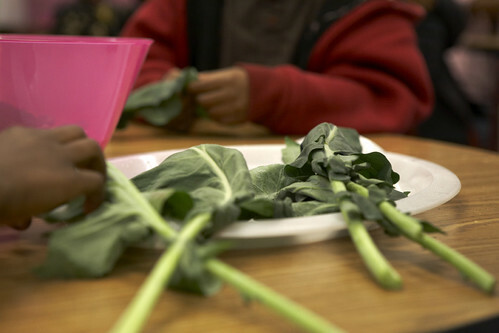 And so began the demonstrations – we did six that day – Farmer Duane explaining the parts of the plant, the kids ripping the greens into bite-sized shreds, rinsing them at the table, and then waiting with anticipation as I sautéed them in the front of the room. Miss Juliet and Chip did their level best to manage their smiles; photographer Amy kept cracking up. By the end of the day, we had our scripts down … explaining the parts of the tongue … holding our noses to explore scent and taste, and MOO! MOO! MOOing! as we chewed like cows to explore flavor and texture. We learned our lessons too – not to leave in sight hot sauce, vinegar, or salt, which the kids all clamored for, because it was there. It was 2pm, and the kids were done with classes – and Career Day. It was time to go home. They meant swiss chard – it’s thick white stem reminded them of bacon. “Can we eat the turnip?” … the raw turnip, roots attached, which Farmer Duane brought to demonstrate where the greens leaves had come from. “PUHLeasee! !” they clamored … and with disbelief, we passed out bits of raw vegetables to the hyper, bouncing kids, who shouted over each other, “I’m the first to try it!” “No me!”, while the shyer girls among them held out their little hands politely, waiting their turn. Photos courtesy the badass Amy Herr, Amy Herr Photography. Thanks to Duane Marcus of Urban Gardener, Miss Juliet Ceballos, and Chip Kaye for their awesome teamwork. 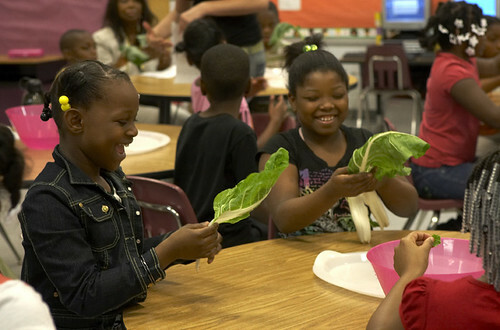 Kudos to Erin Croom of Georgia Organics for spearheading the Chef to School program among Atlanta schools, and Miss Jacinta Williams of Cook Elementary School for inviting us. Those of you who have volunteered with us at rogueApron know that there’s really nothing better than the feeling you get, handing people a warm plate of deliciousness to enjoy. It’s addictive – and it’s a simple act of kindness that can make all the other badness – like 401k crash, pirates, and swine flu just disappear. 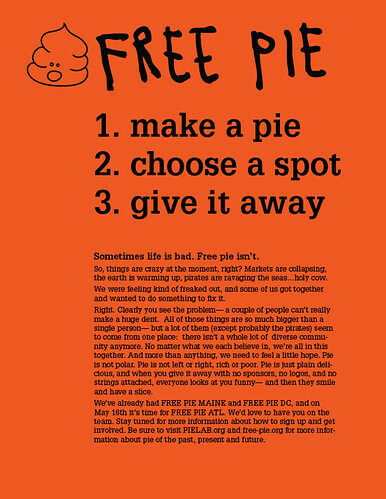 So, we’d like to recruit you to the concept of Free Pie. It’s not a rogueApron thang per se – our lovely friends Melissa and Reena are the geniuses behind this movement – but it seemed like something that folks in our community would really enjoy. So. 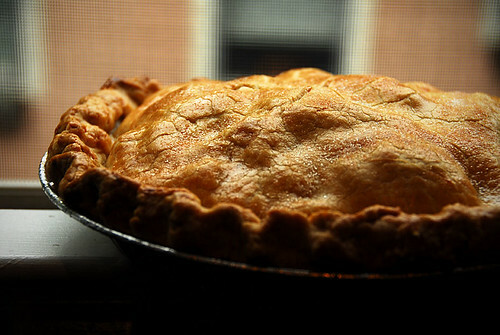 Make A Pie. Choose a Spot. Give It Away. Yep, it’s really that simple – and that good. For more info on this simple, rad idea, visit the site at free-pie.org, and sign up for the list on the bottom right of the site. The gals are recruiting neighborhood captains; check this map at tinyurl.com/freepieATL. Sign up on eventbrite for your neighborhood! If you love this idea – and you should! – please help us recruit captains by printing out the flyer below and placing it in traffic’d areas, like your favorite coffeeshop. You da best!